​Wednesday, September 12th 2018 Speaker "Rachel Potvin-CI Specialist with Advanced Bionics"
Wednesday, October 10th 2018 Speaker Our own Mike Miles on "Convention Topics Review"
Wednesday, November 14th 2018 ​Speaker Ken Kistler "Battling Tinnitus"
Wednesday, May 9, 2018 "InnoCaptions" Captioning and cell phone app usage! "ReSound provides excellent sound by offering innovative hearing solutions that combine original thinking and design with solid technology - all based on deep audiological insight and understanding of hearing aid users." More info about resound can be found at www.resound.com. practices, and organizational structures to improve access to assistive technology for all people with disabilities. She has practiced aural habilitation/rehabilitation audiology for over 30 years. Her training, research, and publications are known locally, nationally and internationally. She is recognized for her extensive continuing education program by the American Academy of Audiology by earning the “Scholar” award for 2003-4. And she has received the distinguished ACE awards from the American Speech and Language Association for two consecutive years, 2004 and 2005. 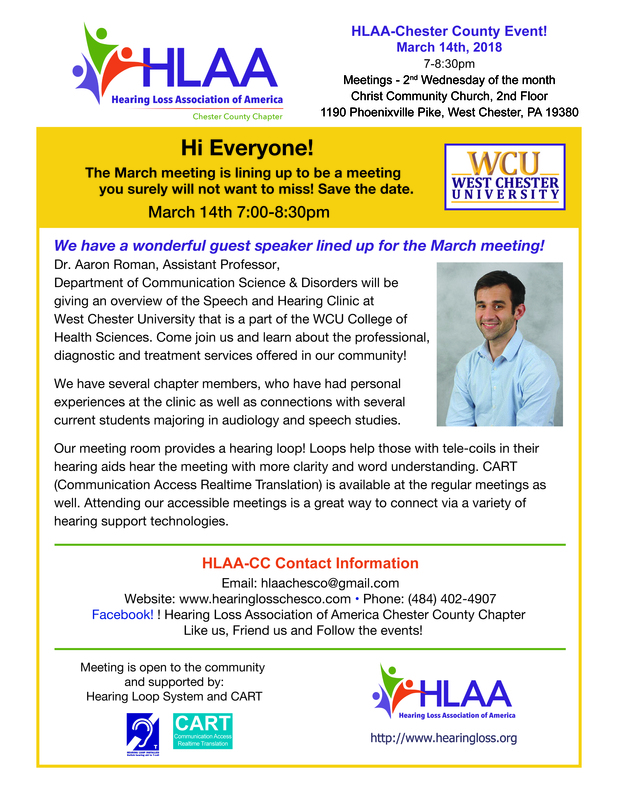 Dr. Curtin is a faculty member of West Chester University since 2000 and formerly its Hearing Clinic Coordinator. She guests lectures at other similar institutions. She is a former Chair for Hearing and Hearing Disorders in Childhood for the American Speech, Language and Hearing Association. September 14, 2016 - HLAA Conference Highlights Roundtable Members that attended the 2016 HLAA Conference in June will highlight some of the memorable moments and share resources and supportive connections. Wednesday, October 12 - Alerting Systems Bill Best, HLAA Chester County Chapter President and HLAA Hearing Assistive Technology Coordinator will present on Alerting Systems that can help individuals that have hearing loss.